As a brand owner, you’re always looking for innovative ways to improve business results but face the challenge of effectively managing the associated risk. You know “playing it safe” is not the answer because it stifles real innovation. Truth is, to accurately forecast business impact of your innovative marketing ideas, you need actionable, predictive data. 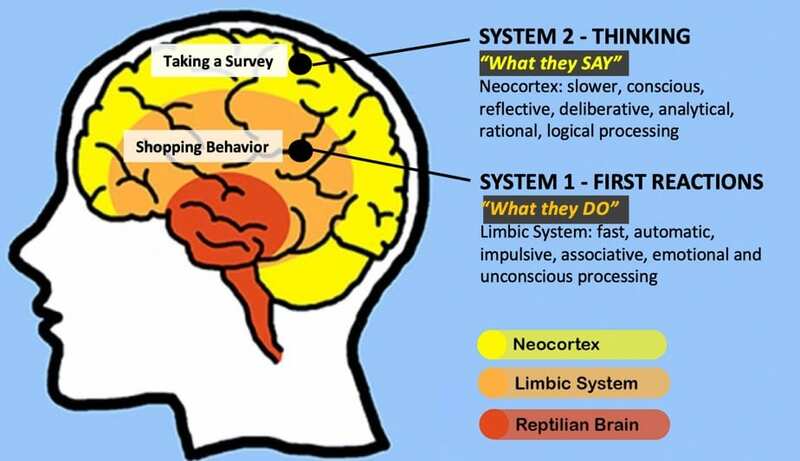 Just “listening to customers” is not enough because the correlation between [what people say] and [what they do] is weak because they tap into two different parts of the brain (System 1 vs System 2). The best source of actionable, predictive data comes from measuring behavior. Given that the majority of purchase decisions are made @ the POP, your brand’s visibility in-store has direct impact sales because a brand not seen is a brand not bought! Also, as a “silent salesman”, pack design & communication materially impact purchase conversion at the shelf. Question is, do you have actionable shopper behavior data to optimize brand performance? Measure your packaging in-store presence and purchase conversion at the moment-of-truth and benchmark performance against design alternatives & competitors. Gain insight on how specific package designs elements are impacting purchasing behavior. Go well beyond the scope of a traditional new product concept test so you can much more accurately forecast new product trial rate and sales potential. This higher level of accuracy traces to measuring actual shopping behavioral vs just listening to what consumers have to say. Build a solid financial model for your new product with best and worst case scenario data. Directly measure the impact your ad concepts have on shopper behavior and uncover the creative elements that have the biggest impact on purchase desire. Measured and recorded 3 times per second. Shopper facts have a confirmed .85 correlation vs in-market results. Enables you to make fact-based marketing decisions. Shoppers are asked to find a specific SKU on-shelf using the V-Shopper's ocular lens after they have finished shopping. Directly measure the effectiveness of advertising and design. Ensure that communication priorities are coming through and are focused on what is most important to your target audience. Also, uncover the strongest brand visual equities of your creative and how well these creative elements support your desired brand perception. Importantly, take all of this creative insight and correlate it with impact on purchase desire so know based upon behavior, which creative elements are the most powerful business drivers. Why did a pack redesign lead to a decline in brand share of market? A team of researchers from two different universities partnered with Kraft Foods, Canada, to test V-SHOPPER versus more traditional in-store testing methodologies. They wanted to determine whether this newer, more cost and time efficient online testing methodology could measure shopper behaviour and attention as well as more traditional and expensive in-store testing methodologies. 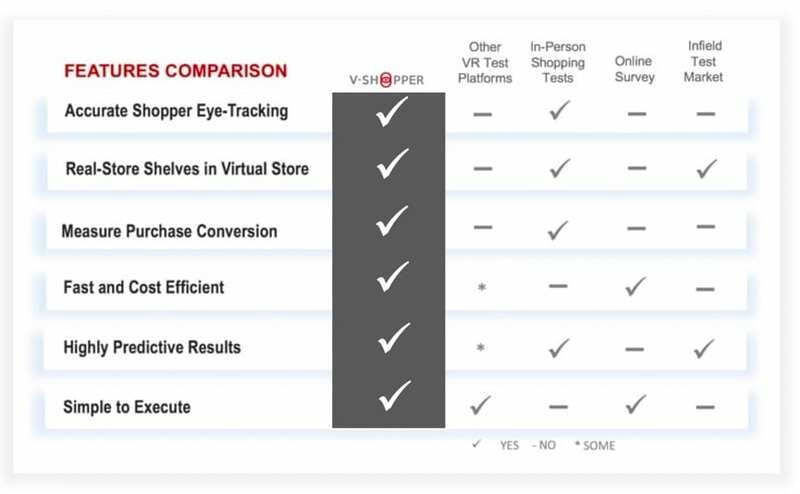 They chose V-SHOPPER for this test because unlike other online testing solutions, only V-SHOPPER has an Ocular Lens feature, a highly effective means of tracking shopper attention online throughout the shopping experience. Two identical tests were run across 5 food categories with 1172 respondents using V-SHOPPER and in-store shop-along methodologies. V-SHOPPER purchase behaviour was compared against in-store shop-along data. In addition, researchers compared online shopper attention data from V-SHOPPER with normative shopper attention data sourced from many in-store eye tracking studies, to determine the shopper attention efficacy of V-SHOPPER. Results showed a very strong .85 correlation between purchase behaviour data generated through V-SHOPPER and in-store shop-alongs. Further, researchers concluded that V-SHOPPER’s Ocular Lens was able to demonstrate expected results in most cases versus what was expected based upon normative shopper attention data. 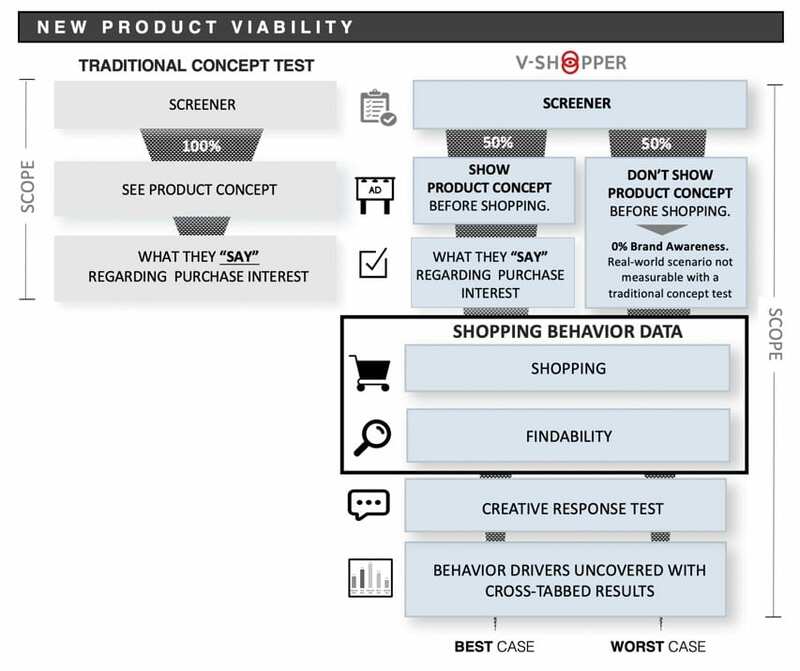 Conclusion from the study was that V-SHOPPER is able to provide managers with a more cost and time efficient methodology to examine the actual impact of marketing actions intended to capture shopper’s attention at the retail shelf and to influence behaviour.